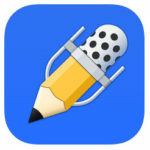 Notability is a notetaking app that can be used to create a variety of documents such as outlines, checklists and text boxes. The flexibility of this tool makes it possible to combine images and text. It is also possible to annotate imported documents, such as PDFs. Writing in Notability can be done with the iPad’s keyboard or a stylus. Users of the app can audio record their notes or record a meeting and add written notes to it. Sharing of notes is possible through email, AirDrop, Dropbox, Google Drive, etc. Users can organize their notes by assigning them a color or organizing them by tags or categories. Various documents can be annotated by importing them (such as PDFs, DOCs, PPTs, images and GIFs). It is possible to search handwritten notes. Handwritten notes can be converted to typed text. The ability to record audio notes can remove barriers for some struggling writers. This app offers a lot of flexibility that can be used to support learning in various creative ways. It is possible to print notes but printing from an iPad can be a challenge for some users.